“Yes sir, Colonel,” I said. The pilot released the binders, and the Eagle’s twin 25,000-pound thrust, P&W F-100 engines launched us down the runway with the enthusiasm of a ZR1 Corvette. O’Keefe rotated the nose and lifted the airplane off the ground in about 500 feet of runway, then lit the afterburners and let the Eagle accelerate at 100 feet AGL. A few seconds later, he pulled the nose up to about 80 degrees of pitch and held it there. The F-15 pegged the VSI and continued to accelerate semi-vertically as if it was being shot at. In order to avoid busting the Mach in a vertical climb directly over Nellis (and booming most of the glass in Las Vegas—not a good career choice), O’Keefe reduced thrust out of 10,000 feet, and we still topped out at FL350 in a little under two minutes flat—a leisurely 17,000 fpm climb. If O’Keefe had left the Eagle on the deck at full afterburner, the airplane would have exceeded Mach i.0 less than 30 seconds after brake release. Try that in your Tesla. During the next hour and a half, Col. O’Keefe allowed me to do virtually all the flying, from ground level to 48,000 feet and from 100 knots to Mach 1.6. One amazing maneuver he allowed me to perform in our restricted area was an afterburner loop. During the brief, he’d asked what I flew to Las Vegas, and I told him it was my Mooney 231. To my surprise, he knew all about Mooneys and had a little time in them, as well. He asked what would happen if I slowed my Mooney to just above stall speed in a full dirty configuration, then added full power and tried to do a loop. Of course, I said the airplane would stall at perhaps 10-20 degrees of pitch. 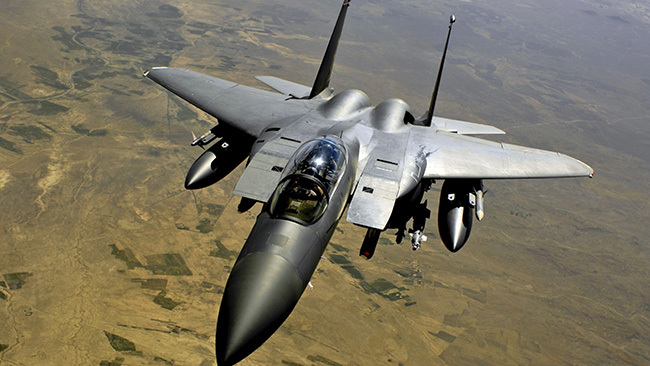 O’Keefe said, “Let’s see what happens in the F-15.” I put the gear and flaps down, slowed to just above stall, pushed power into max burner and hauled the stick full back. The Eagle pitched up obediently, arced uphill on sheer thrust to the inverted position, then fell out of the maneuver as we came down the back side. I remember noticing at the top that airspeed was buried at zero. The F-22 and F-35 may be the new ultimate fighters, but the F-15 Eagle was and remains one of the world’s best-performing air superiority machines. And I actually got to fly it. Wow.